Twenty-four panes, count 'em. Maybe the window was crafted back in the days when all glass was hand-blown and couldn't be cut into larger pieces. Even then, nine or twelve panes would have filled this window. Someone, however, looked at the very random sizes, shapes, colors and textures of the fieldstone wall and thought a little order might be welcome. 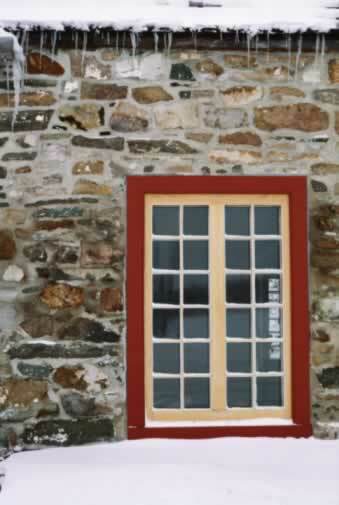 A row of these windows marching down a wall would add a touch of military precision. Natural wood tones for the wooden muntins seemed right for a building of native materials, but the colorful field stones could overwhelm that orderly intent. Ah! A splash of color for the window frames - just the touch. Over the years that splash may have been blue or green or brown, if you dig through a century or two of paint layers. But red seems to make the required statement, no questions asked.